Note: This article has been and will continue to be updated in March 2014 with a short addendum at the end with more suggestions provided in response to this post by readers. After a week in Houston for FotoFest, I thought I would write a comprehensive review of the experience as a reference for those who will attend the event in the future and also because many of the comments will apply to any photographer attending any review anywhere. FotoFest was founded in 1983 by photographers Frederick Baldwin and Wendy Watriss along with European gallery owner Petra Benteler. The first FotoFest International Biennial was held in 1986, making this year's version the fourteenth. The biennial is primarily known for its four week-long portfolio review sessions, but along encompasses an exhibition of ten photographers discovered in the past biennial, several other exhibitions focused around a single theme (this year it's Russian photography), lectures, workshops, a film and video series, conferences, and a print auction. The portfolio review - held at the DoubleTree Hotel downtown - provides attendees with just under 20 scheduled reviews over four days with a mix of curators, gallery owners, magazine editors, and other photography professionals. Attendees are provided a list by email before attending in order to rank their top 25 choices from among the list of roughly 50 reviewers offered for their session. This year attendees received reviews with just about everyone in their top 20, minus one or two. Unlike other similar events, unofficial reviews outside of those scheduled are expected by both reviewers and photographers. If you are weighing which review to attend in the coming years, one advantage of FotoFest is that many of the reviewers overlap with events like Santa Fe and Photolucida, but at FotoFest you will get more reviews over more days than at either of the other events for about the same price. Also in comparison to others, FotoFest is known as a review where things happen - publications, shows, and other offers - especially in the weeks and months after the review, but also occasionally during it. The event is unjuried, meaning you'll see commercial work and safari shots alongside work that pushes conceptual boundaries. Despite being unjuried, the majority of the work is professional quality. In a sentence, the event is well-organized and valuable (small suggestions which can be found at the end of this article aside), especially for social networking and to a lesser degree for feedback on your work itself. Do your research before making selections of reviewers. This is vital: fully read who each reviewer is and take the time to rank them with a full knowledge of who they are. This sounds obvious, but didn't seem to be done by a number of photographers there. Do some dry runs. To maximize your dollar and get the most you can from the week, practice your presentation before arriving, ideally with someone similar to the reviewers who will be present (a gallery owner, a curator, etc.). If that's not possible, do it with your four-year-old, your mechanic, or your cat - anyone. It will help you get your patter down and understand what's possible in a 20 minute conversation. Be rested when you arrive. See if you can't get your printing finished a few days before arriving - at least - so that you can arrive with energy to take full advantage of the intense days, from 9 AM reviews to 2 AM bar-closing conversations. Keep your introduction of yourself and the work short. One to two minutes, absolute maximum. The time is tight - more on this as the article progresses. More is less in terms of amount of work shown. Again, given the time you have, you can't make your way through 4 projects or 50 prints and still have a real conversation. The consensus seems to be to bring a primary project with one or two backups in case the first doesn't resonate with the reviewer or to show outside the review time. Some photographers have different projects to show to different reviewers based on who the reviewer is and what side of the photography world they represent. That's also a successful strategy if you have the work as well as the time to print that many images. 20 prints seems a consensus good number, with 25 being an absolute upper limit, depending on the project and what is needed to show it properly. Respect your time slot. When time is called, get moving and respectfully avoid taking time from others. Print size considerations. While some work needs to be seen large, perhaps because of the process or concept, most work is best seen between 11" x 14" up to 20" x 24". Larger becomes cumbersome. Avoid mattes as a general rule and simple clamshell portfolio boxes seem to work best. Guide the conversation. The (too) short review times means that you may need to step in to direct the conversation if the review isn't covering what you'd like it to. Some reviewers have a tendency to drift if not gently pulled back towards the photographer's work, goals, and questions. Having a particular goal for the conversation will help you guide it. They will announce when you have 5 minutes left in the review. This is helpful and the moment to begin to guide the conversation to your goals for it if it's not there yet. It's the time to focus in on asking about how to submit work to the reviewer or their institution and on other names that they would recommend contacting about the work, or to make a concrete next step with the reviewer if things are going well. Approach reviewers you are not scheduled with about meeting with them. Almost all reviewers seem open to this and unlike other portfolio reviews, this is part of the fabric of the event. You may only have 18 or 19 scheduled reviews yet walk out at the end of the week with 30 reviews. Hang around the review area even if you're not slated for a review. You will meet other photographers, see their work, show your work, and most importantly, after the time slot has started if a reviewer has an open session, an announcement will be made and you'll be able to jump on a few reviews you weren't scheduled for. You might be able to swap reviews. There is a bulletin board for people looking to change reviewers or times. Don't sell yourself short. While the majority of the photographers who attend FotoFest are somewhere on a professional track, if you are a student, hobbyist or just getting into photography, there's no need to qualify your work in each review as such. Present yourself as a photographer and let the reviewer make their determinations from there. Know your reviewers. With so many reviews you may forget who some of the people you are scheduled to meet with are since reading their biographies way back when filling out the reviewer request form. Review their biography before having a review with them. This will help guide the conversation in your mind and avoid a potentially embarrassing revelation that you have absolutely no sense of who they are or what they may be able to offer. Stay open to all conversations. Some of your most informative and helpful reviews all week will probably come from a random person, an unscheduled review, or another photographer attending the reviews. And some of the reviews you are most excited about will be flat. On the first day people may be cold. 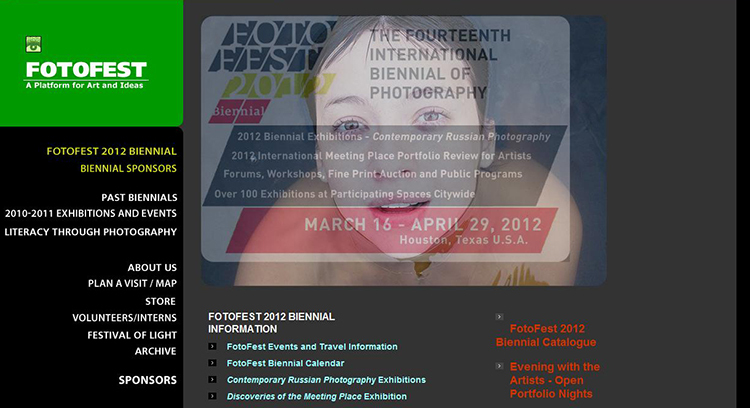 Unfortunately FotoFest will fill your first day with many of your top choices. Many are arriving the night before from other reviews or other countries and will be tired, disoriented, and in need of an IV with coffee. There's really nothing to be done other than to know that the conversation may not be the best, to take it with a little salt, and suggest to FotoFest they change this structure. Leave a simple "leave behind." You should have a postcard or business card with your contact information clearly presented with an image from the project to leave with the reviewer. This will help them remember the project, connect it with your name, and give them an easy way to continue to be in touch with you about your upcoming solo museum show they want to offer you. Include name, location, website, email address, and phone number. Generally, reviewers don't want to get books, packets, and other large items - they'll leave them at the hotel for their size and weight. FOLLOW UP! Be sure to send your reviewer a thank you after returning home. This could be an email, could be a physical mailing - attendees varied on their strategies. Everyone, however, recommends doing so, even if the review didn't seem to go well. It's the first step towards continuing to grow a relationship with the people you have just paid a lot of dollars to meet. The review is held in the ballroom on the second floor. Some say it's a little cold - bring something in case you think so as well - and the lighting is crap. Split a room and stay at the DoubleTree Hotel where the reviews are held. While it came out to about $85 a night and while you can find a bare bones hotel for about $35 on the edge of town, the DoubleTree is worth it. It's energy-saving during a high intensity week and staying in the hotel where the event is actually held makes it easier to be fully present at all events, formal and informal. At least a few attendees last week had discouraging stories about their stays in budget hotels. Hang out and have more drinks. The lobby bar of the DoubleTree is a popular hang out at night for both attendees and reviewers and important in terms of solidifying friendships and connections during the week. Attend session two or three. If you do so and arrive a few days early and leave a few days late, you will be able to connect with both reviewers and attendees from the sessions before and after, extending the value of your stay in Houston. Get on the bus. FotoFest organizes buses that leave in the late afternoon on 3 of the 4 nights that reviews are held. They will take you to exhibitions and out for (overpriced, you pay for it) food. This is an opportunity to get to know people as people, not only as reviewers and photographers. You may have the chance to expand on conversations you've had in reviews, but this is mostly a chance to hang out, get a little sense of Houston, unwind, and connect. Have limited expectations for Public Portfolio Review Night. On one of the nights during the week, FotoFest holds a two-hour open portfolio for the public to come and theoretically purchase work. The great odds are you're not paying for your week here with sales from this event, however. The attendance is decent, but sales slow. It may be better to go into the night thinking of it as a chance to look at the work of other photographers there and connect with a few reviewers you're not scheduled with. Digest later. This is the week to take in everything - pursue every conversation, meet anyone. Save the project and career choice re-evaluations until you're back home. Demeanor. Similarly, if you're an introvert or if you're exhausted, fight to extend yourself anyways. The true value of this event is social networking, not life-changing critiques of your work. Unfortunately, at least during my session, the reviewers and attendees tended to congregate separately, but don't be too bashful in talking to reviewers outside of the reviews - especially about anything other than your work. Reviewers talk. Even if the reviewer is horrible, don't insult them and don't walk out. Endure. The photographers in attendance talk about the reviewers and reputations form quickly. By day two you'll hear which reviewers aren't worth your time. The same is true of reviewers, however - they talk about your work and you as a person and the absolute last thing you want to do is establish yourself as the resident session prima donna headache. I can't say not having visited Houston before this event felt like a major hole that needed filling in my life. The city is pleasant in March and April, however, and there's much more to see than you'll be able to even if you stay a couple extra days to explore the city - which you should. During the days with reviews you could really be anywhere in the world - the energy expended combined with the review schedule leaves little left for exploring. That being said, stay and enjoy the city to relax beforehand or unwind after. West of downtown: Rothko Chapel, Menil Collection (currently featuring a Richard Serra drawing show and a fantastic temporary room off the Surrealist collection called "Witnesses to a Surrealist Vision"), Cy Twombly Gallery, and the Houston Center for Photography - all within two blocks of each other. The Byzantine Fresco Chapel is also nearby, but is currently closed. South of downtown: The Houston MFA and Contemporary Arts Museum Houston in an area with beautiful houses and parks. Downtown: JP Morgan Chase SkyLobby (60th floor observation space looking west), the Julia Ideson Public Library building a block north of the DoubleTree, and the various block-sized parks. Restaurants: Pappasito's weekend brunch with 99 cent frozen mimosas and famous fish tacos - found in the Upper Kirby neighborhood close to the Menil Collection and nearby arts destinations. Azuma for sushi in the beautiful Post Rice Lofts building, about a 15-minute walk from the DoubleTree. The local METRO train has a north-south line that gets you easily from downtown to the Houston MFA area. Houston has two airports: George Bush Intercontinental Airport (IAH) - yep, you're arriving in Texas - as well as Houston Hobby Airport (HOU). Take a SuperShuttle, or split a cab with at least one other participant and it comes out to about the same price. IAH is about a half-hour ride out of the city. Current rates for a cab to/from IAH are about $60; a SuperShuttle runs $24. A SuperShuttle to Hobby is $20. Not sure on the price of a taxi to Hobby. DoubleTree promo codes. If you're still there this year, you can get free Internet in your room with Promo Code "DoubleTree1". If you're there in the future, seek out what the current promo code may be. Otherwise, you'll have free Internet, but only in the lobby. Free cookies! If you stay at the DoubleTree, you will get a free hot cookie on check in. If you politely or humorously engage the front desk, you can milk them for more cookies during the week. Food court and deli. The food court at the bottom of the northeastern tower of the Allen Center, connected by walkway to the FotoFest ballroom review room, has a great variety of reasonably priced lunches. Jason's Deli, across the courtyard looking south of the review room, has long lunch lines, but at the take-out counter in the front, you can get premade salads and other things, skip the line, and sit outside. Free coffee refills. The Einstein bagels one block east of the DoubleTree allows free coffee refills all-day for about $2.50. Facebook page. This year, a Facebook page was formed for the event where you will find people offering to sell their spaces, looking for roommates, and able to answer questions from where to develop film to the best local BBQ. Make reviews 25 or 30 minutes and schedule fewer. I think that this would help raise the quality of each review, without comprising volume much. Most people I talked with felt 15 reviews with more depth would have been more valuable than 18 or 19 faster reviews. And given that many unofficial reviews take place, everyone still would walk away with many more reviews than at any other similar event I'm aware of. Put the top reviewers on day 2, not day 1. As mentioned above, people are arriving from around the world, tired, and a little cold the first day. Placing top choices on day 2 would give photographers a day to warm up and get on their game before meeting their top choices, while still having several days left to continue conversations with them and to continue to get to know them. Consider a portfolio review time for the photographers in attendance. The biggest unfilled interest of most photographers at the end of the week that I spoke with was the chance to see more of each other's work. Finding a structured time with open portfolios for the photographers and reviewers in attendance - in addition to the open public portfolio night and possibly just for an hour or two before it - would be both enjoyable and valuable. If you have attended FotoFest, please send me other information you feel I should include. Addendum, March 2014: I'm going to add comments and suggestions from others as FotoFest 2014 approaches. Pugilist Press, on Facebook's Flak Photo Network, suggested this link for a much fuller list of food options and recommendations. Paula Tognarelli, Executive Director at the Griffin Museum of Photography, posted a link to this post on her Facebook page which generated a number of additional helpful suggestions that I will reprint here with the permission of those that commented. - I would like to add that while asking for reviews outside of the review process is expected as Tom mentions, you may be told no. Don't hold it against reviewers. The Fotofest event is a pretty intense experience for photographers and reviewers alike. - I would suggest photographers start with what they want to accomplish in the review after the quick intro. This way the reviewer can focus since there is so little time. Also get the work on the table as soon as [you] can and talk while the work is viewed. - Ask the reviewer if you can be in touch after the reviews to keep them apprised of you and your work. And with what frequency. And by what means. - Number the backs of prints to keep your sequence. The work gets out of order easily and there is very little time between reviews frequently. - As the reviewer should be giving [you] his/her full attention give them [your] full attention. As I am always placed in front of Anne Wilkes Tucker, I have been amazed at photographers who would keep an eye on her to see if she was free rather than on my review. I know she's more exciting than me! Houston-based gallery owner Catherine Couturier added, "As a reviewer: I always ask, first thing, 'How would you like to spend our time?' Have an answer! Do you want to discuss edit, representation, pricing, sizes.... Lets make sure we spend our time together the most effectively." She also wrote, "I'd add to that: don't think that getting a show is the end-all be-all of the reviews. All the reviewers have advice to offer and you will definitely get the most out of your time if you go into each review with an open mind. I've had photographers sit across from me and I can immediately tell they aren't open to the process. Be open to good comments and bad, and realize that all the information is helpful to hear, even if it just makes you question something before discarding it."